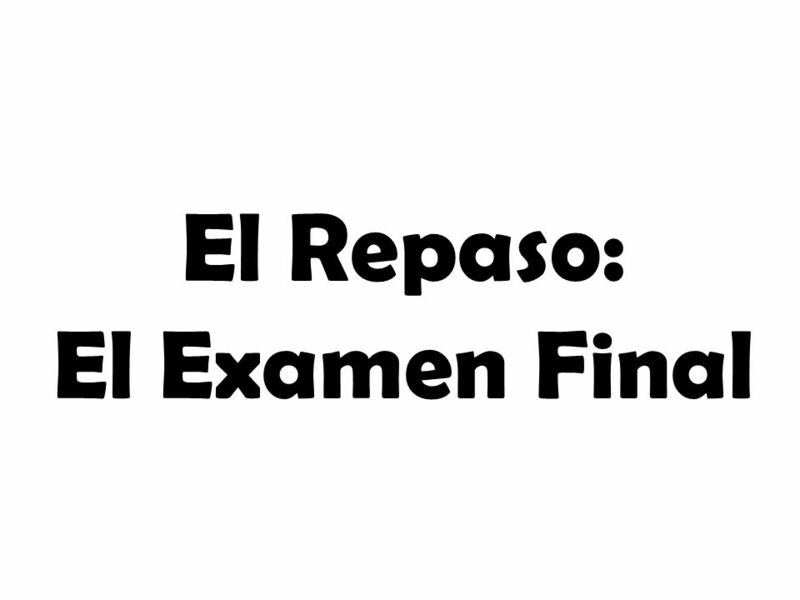 El Repaso: El Examen Final. 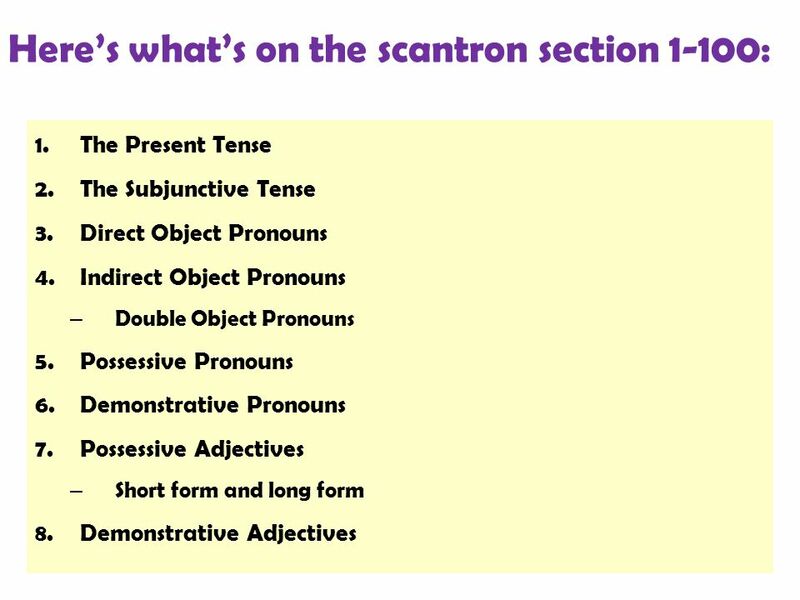 Here’s what’s on the scantron section 1-100: 1.The Present Tense 2.The Subjunctive Tense 3.Direct Object Pronouns 4.Indirect. 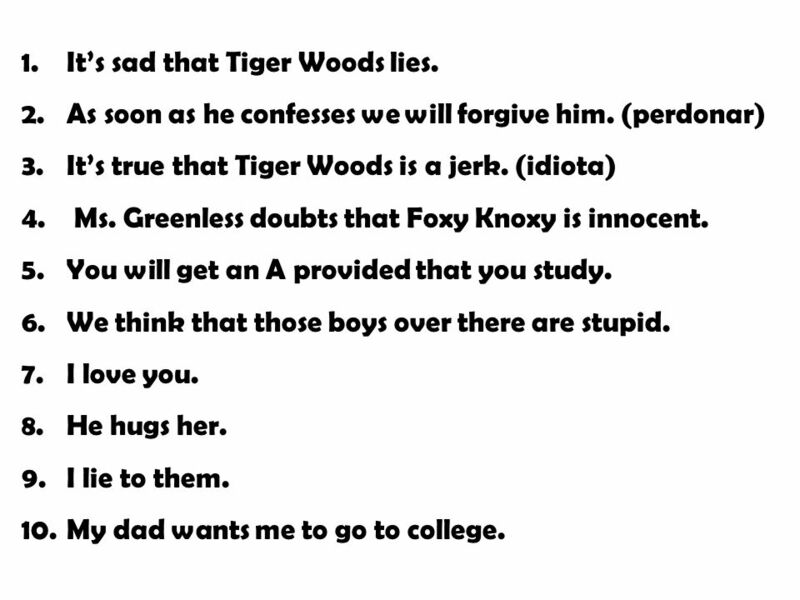 5 1.It’s sad that Tiger Woods lies. 2.As soon as he confesses we will forgive him. (perdonar) 3.It’s true that Tiger Woods is a jerk. (idiota) 4. Ms. Greenless doubts that Foxy Knoxy is innocent. 5.You will get an A provided that you study. 6.We think that those boys over there are stupid. 7.I love you. 8.He hugs her. 9.I lie to them. 10.My dad wants me to go to college. 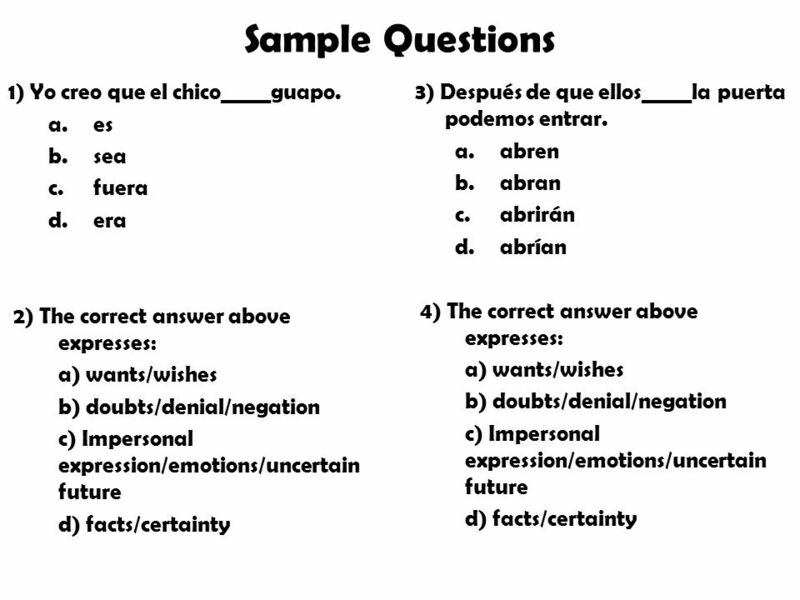 Download ppt "El Repaso: El Examen Final. Here’s what’s on the scantron section 1-100: 1.The Present Tense 2.The Subjunctive Tense 3.Direct Object Pronouns 4.Indirect." 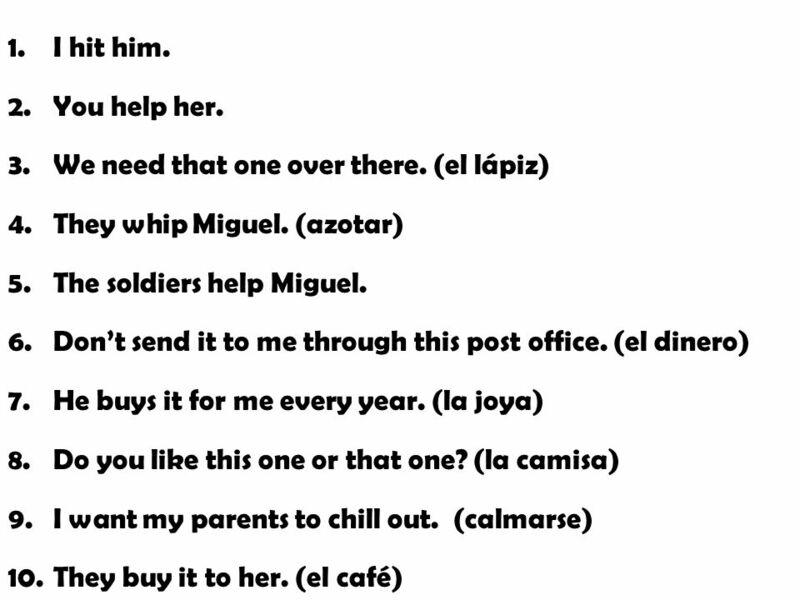 Indirect Object Pronouns Weve seen three types of pronouns so far: – Subject: yo, tú, él… – Reflexive: me, te, se… – Direct object: me, te, lo, la… In. The basics. 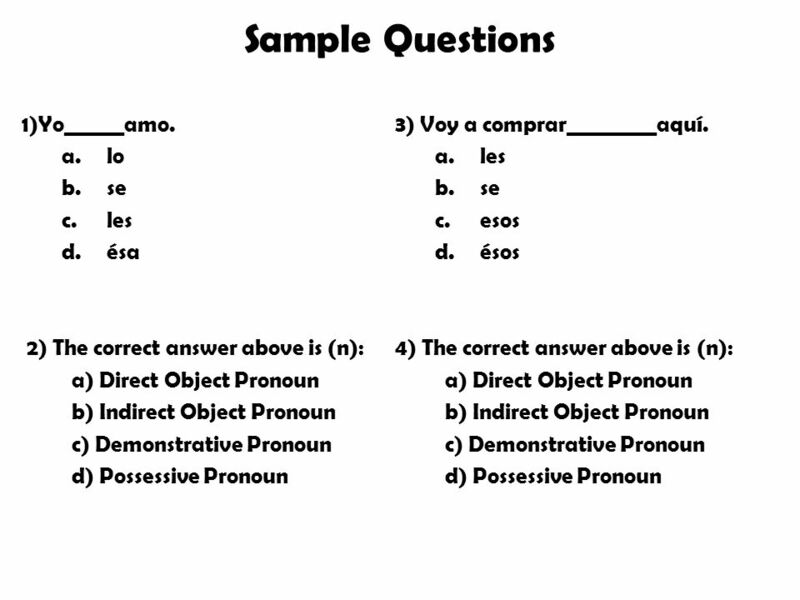 Pronouns - These are the most important ones: Object pronouns: these pronouns are used very often. Lots of students confuse them with the. The present perfect subjunctive refers to actions or situations that may have occurred before the action in the main verb. Me alegro de que hayas trabajado. Ahora presentamos: El Modo SUBJUNTIVO SUBJUNCTIVE MOOD. Español 1 Unidad 6: Ir de compras Día 8.